Beautiful, detached seaside holiday cottage for up to 4 guests on the beautiful Isle of Skye, perfectly located close to the Quiraing mountain range, old man of storr, kilt rock, Duntulm Castle, Skye museum of island life, Staffin Dinosaur Museum & Uig. Spectacular views across the sea to mainland Scotland. footprints at both Staffin beach & brothers point, Staffin Dinosaur Museum & Uig. Driftwood Cottage is a detached former Blackhouse built in 1890, recently renovated to a modern standard, providing Self catering for 4 persons in 2 bedrooms. The cottage occupies a stunning hillside location above Staffin Bay with spectacular views across the sea to mainland Scotland. Situated in the crofting village of Staffin just 25 minutes from Portree, Driftwood Cottage makes an ideal base for exploring the Trotternish Peninsula and the whole of Skye. The property is the owners former family home which they lived in from 2010 -2016 and consequently ‘oozes’ a wonderful homely charm. The family pride themselves on attention to detail to ensure that every need is catered for and relaxation is paramount. The Kitchen/Dining Room 29Sq Metres / 310 Sq Ft. This spacious but cosy kitchen is the best room in the cottage – light and airy, it offers the best views and has been left as a wonderfully functional family kitchen. The ‘Stanley Rayburn’ cooker/boiler and large oak dining table, make this a warm and comforting room for socialising. The kitchen is fully equipped with a gas hob/electric oven, microwave, coffee machine, fridge/freezer & dishwasher. Having lived in the cottage for many years and cooking/baking being a passion of the owners, they have equipped the kitchen to a high standard and hope that it will exceed expectations of a self-catering property. The Sitting Room 12 Sq Metre / 120 Sq. Ft. This room offers wonderful views and is warm and comfortable. We have two sofas, bookcase and a large LCD smart digital TV (internet enabled) and DVD player. There is also good selection of DVD’s and a selection of games and books. There is plenty of space to stretch out on the sofas after a day’s walking/sightseeing. A washing machine and separate tumble dryer is provided and this room is also useful to store muddy boots and wet coats. An iron and ironing board is also provided. Plenty room here to store luggage. There is no better way to end the day than to fall asleep to the relaxing sound of the sea. Boasting wonderful views of Staffin Bay and mainland Scotland, the first bedroom offers spacious and comfortable accommodation, with a super king size bed 6ft 8 inch x 6ft (205cm x 182cm), inbuilt wardrobe, Chest of Drawers & dressing table. All windows have Velux adjustable blackout blinds, a necessity in the summer when its only dark between 2330hrs and 0230am! This lovely twin-bedded room also boasts magnificent views of the sea and surrounding countryside. Slightly smaller than the other bedroom, this room benefits from an attached WC (Toilet & small washbasin only) 2 x Twin beds 39 inches x 80 inches (100cm x 205cm) Small wardrobe & drawers. Velux adjustable blackout blinds on both windows. Free Wifi is availble in every room. Total Combined living area of house including bedrooms & bathroom is 88 Square Metres (920 Sq Ft.) All rooms are fitted with smoke and carbon monoxide detectors. Driftwood Cottage sits in a large enclosed garden with a small gate that leads down to the beach at Staffin Bay. A patio with outdoor seating, allows you to sit and soak up the view on a sunny day. The Cottage is equipped with free wireless broadband and a telephone for local calls. Driftwood Cottage is perfect for a family or 2 couples who are looking for that little bit extra, with comfortable accommodation offering more freedom and flexibility than a hotel. 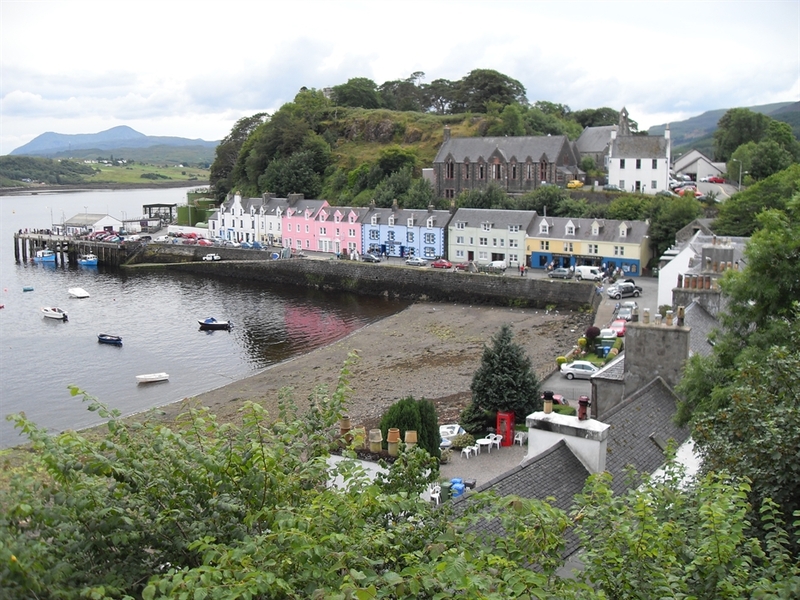 If you want to get away from the fast pace of life and feel the need to recharge your batteries, plan your trip to the magical Isle of Skye and make Driftwood Cottage your home from home. There is a Fishmonger who comes to Staffin every Tuesday to sell fresh fish and seafood – contact the owners and they’ll arrange for him to come to the Cottage! FREE WI FI - Superfast fibre approx 56mbps perfect for streaming films like netflix/ Amazon prime etc and is available in every room. Mobile/Cell signal is a good quality strong signal from most rooms in the cottage.